Communities under traditional leaders, especially in rural areas, will be empowered to have a final say through majority votes when their leaders enter into partnerships or contracts. 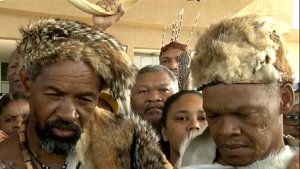 This once the Traditional and Khoisan Leadership Bill is signed into law. The National Assembly passed the bill earlier this week with the amendments made by the National Council of Provinces (NCOP). It was first passed by the Assembly in November last year, sent to the NCOP for Concurrence and then the NCOP made changes and sent it back to the National Assembly. Co-operative Governance and Traditional Affairs Committee Chairperson Richard Mdakane says the amendment made by the NCOP was necessary. The post Communities under traditional leaders to have the final say appeared first on SABC News – Breaking news, special reports, world, business, sport coverage of all South African current events. Africa's news leader..